Years ago I spent a morning with Chef David Lamonica of Scott’s Seafood in Folsom, California, learning all about preparing seafood and sauces that work well with seafood. Of everything we prepared that morning, a simple pan fried haddock with this lemon-garlic butter sauce was the most delectable. To make the sauce first you combine clam juice (can sub chicken stock), milk, dry sherry, shallots, and garlic. Bring it all to a simmer and let it boil until it has reduced by half. In a separate pan, make a roux with a tablespoon each of butter and flour. Then add the reduced clam juice sherry mixture to the pot. After that comes the butter. There’s a lot of butter in this sauce which is why it tastes so good! But to incorporate the butter without having the sauce break, you have to do it slowly. 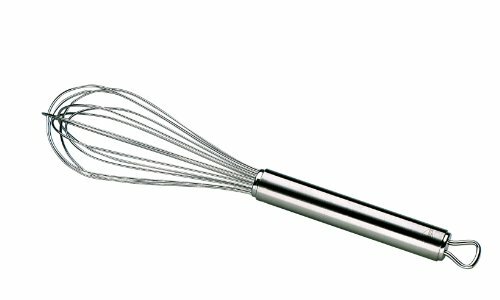 Just whisk in a couple tablespoons at a time. Then stir in some lemon juice, add some salt and white pepper, and you are ready to serve! The sauce is perfect for fish and seafood, or simply tossed with pasta. Need to make ahead? Just chill until you need it, and reheat on the stovetop or heat in the microwave for a few seconds until it loosens and warms up. Use whole milk or cream with water. Do not use low-fat milk or the sauce may curdle. 1 Simmer and reduce the liquids, with garlic, shallots, and bay leaf: Place first six ingredients (clam juice, sherry, whole milk, garlic, shallots, bay leaf) in a small saucepan. Heat on medium high heat and let simmer until the liquids have reduced by about half. 2 Make a roux: In a separate saucepan (1-qt minimum) prepare the roux. Heat one tablespoon of butter in the saucepan on medium heat until it is foamy. Sprinkle in the flour, stirring a couple of minutes with a metal whisk until well mixed (tan, but not browned). 3 Slowly add liquid mixture to roux: Slowly add the reduced mixture to the roux, stirring quickly to incorporate. When you first add some of the mixture, the roux will bubble up. Just keep adding the mixture and keep whisking to incorporate. 4 Slowly incorporate butter, 2 Tbsp at a time: Lower the heat to low. Remove the bay leaf. Slowly whisk in the butter, 2 tablespoons at a time. Let the butter tablespoons fully melt and be incorporated into the sauce before adding more tablespoons. 5 Stir in lemon juice, salt, and white pepper. Add some more clam stock or water if the sauce is too thick. Hello! All photos and content are copyright protected. Please do not use our photos without prior written permission. If you wish to republish this recipe, please rewrite the recipe in your own unique words and link back to Lemon-Garlic Butter Sauce for Seafood on Simply Recipes. Thank you! This is the most delicious sauce! We use it on seafood, chicken, egg noodles, etc. What a great addition to my culinary repertoire! Hi Elise. Just found your website today and have 3 or 4 “must makes” already! Question: Is there any way to make this sauce in advance and then reheat when needed? I’m thinking maybe I could do everything up to adding the butter and then reheat the sauce and add the butter right before I’m ready to serve. Your thoughts? Hi Rory, I’ve made the sauce ahead of time and reheated it for a few seconds in the microwave, just enough to loosen and warm it up, and it worked great! Hi Naz, you can use chicken stock. Regarding your comment about alcohol cooking off, be careful! The amount of alcohol left in the prepared food depends on the technique used in cooking. Reducing the sherry alone till it is almost evaporated, then adding the other liquids and reducing again would leave very little alcohol BUT combining the liquids and reducing them together does not cause the alcohol to burn off. Though governed by laws of chemistry, cooking chemistry was learned experimentally and handed down by word of mouth. That is why traditional French cooking always adds and reduces the wine before adding the other liquid. Yes, Ronnie – I just substitute the alcohol. I do not eat fish – I just don’t like seafood — I liked Shrimp until a couple of years ago – my taste changed again – and now – no seafood. So – I look for sauces or revise sauce for chicken. I also don’t eat much beef – but love pork – So – Elise – so I’m going to be thumbing through looking for Pork makes. If I want to use this lemon-garlic butter sauce for pasta, should I leave out clam juice from the ingredients? Thanks! Hi Christine, with the clam juice the sauce is excellent for pasta, but it will give a taste of seafood. If that’s not what you are looking for, I would substitute the clam juice with chicken stock. I’ve been perusing your website, and I’m really curious to try this recipe, as I’ve been looking for something like this. I have one question though: Could you provide a possible substitute for the sherry, as my family and I don’t drink alcohol? It would be much appreciated. Elise – Like you and your family- I do not drink — and thusly As much as love the taste of dishes cooked with wine — , when I really want that — There are several restaurants that I enjoy. I use the white vinegar and Two — TBS of White Grape Juice. Hi Sara, dry sherry is one of those ingredients that is really hard to substitute. I’ve seen references to using unsweetened orange or apple juice in place of it, but I have no idea how that would work with this recipe. You might just sub it out with more clam juice and milk. For what it’s worth, most of the alcohol boils away when you make the sauce. I only keep dry sherry around for cooking and the alcohol isn’t remotely noticeable when the dish is done. I used a little less half & half instead of milk and added small shrimp & crabmeat plus an extra squeeze of fresh lemon juice. Excellent recipe. Thanks! Thank you for this recipe! MMMMMMMM good! I used only 1 stick of butter and added canned fire-roasted tomatoes and it was creamy and delicious.